Michael Jenkins uses wind turbine on his Stockton property. Seeking a less carbon-intensive way to power his Worcester County home, Michael Jenkins researched renewable energy options. He realized he had a great resource at his Stockton property: Wind. Pittsville-based Communications & Energy Services, an Eastern Shore energy system installer, provided Jenkins with an estimate for a Skystream wind turbine from Southwest Windpower. 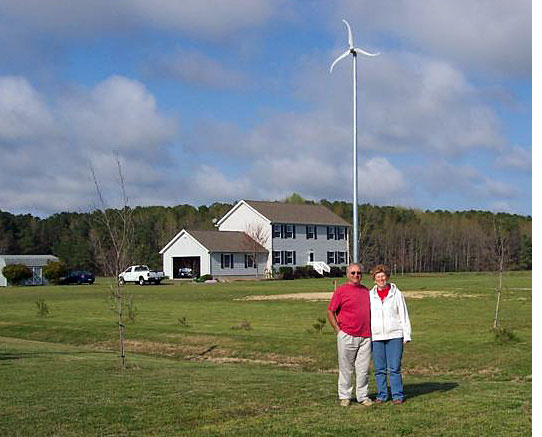 Jenkins applied to the Maryland Energy Administration’s Windswept Grant Program in November of 2010, and was approved for a grant of $6,160, made possible through funds provided by The American Recovery and Reinvestment Act. The grant covered about one third of the total project cost. The Windswept Grant Program is part of the Clean Energy Grant Program, which provides home and business owners, non-profits, and government entities with financial assistance to install solar photovoltaic, solar water heating, geothermal heat pump, and wind turbine systems. The program is designed to help satisfy Maryland’s Renewable Portfolio Standard (RPS) requirements and EmPOWER Maryland goals.